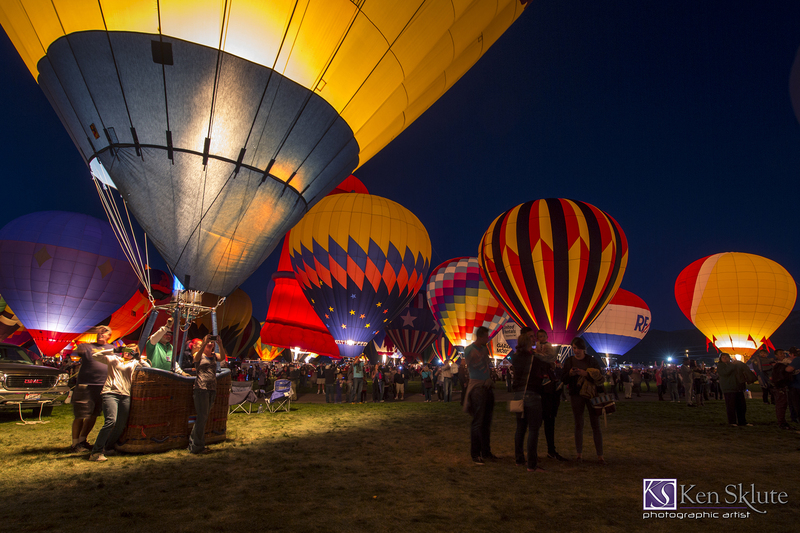 As a photographer, the Balloon Glow will surely rank as one of your favorite moments after coming to the Canon Albuquerque International Balloon Fiesta, or other similar festivals. The best vantage point for the glow would be facing west, photographing directly into the sunset or twilight sky. 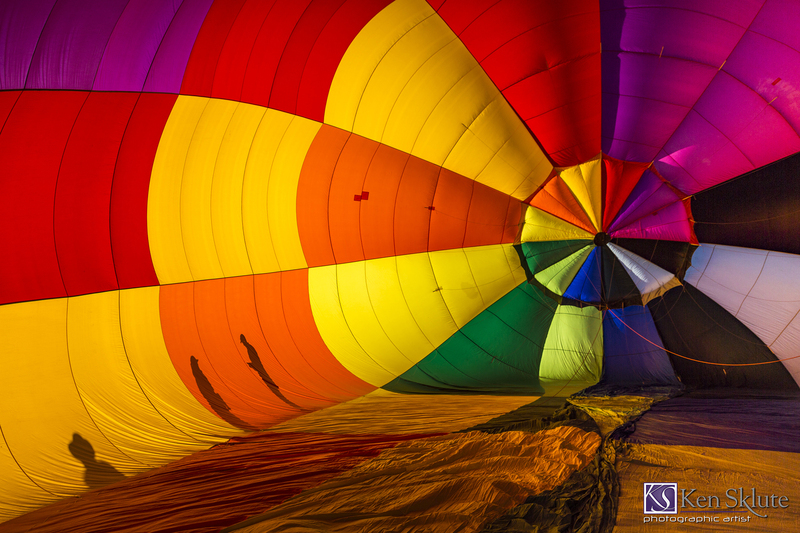 The light inside of the inflated balloons will soon balance with the rich blue sky – this is a great way to add depth and dimension in my photographs, helping my viewer’s eye wander all around the image and see detail in the foreground, middle ground and background. As the sun begins to get low in the sky, you will find the inside of the balloon envelope alive with beautiful warm light and shadows from the people walking close by. It would be a great time to look inside the balloon with a medium wide-angle lens, like a 24-105mm (for full-frame cameras) or the EF-S 15-85mm IS lens (for Canon APS-C sensor cameras) to capture the last light of day bathing the fabric. As the pilots “stand up” the balloons, this is a great opportunity to photograph the task of “going hot” against the sunset sky. Very often, in the morning inflation, this procedure is done before the sun comes up over the horizon. 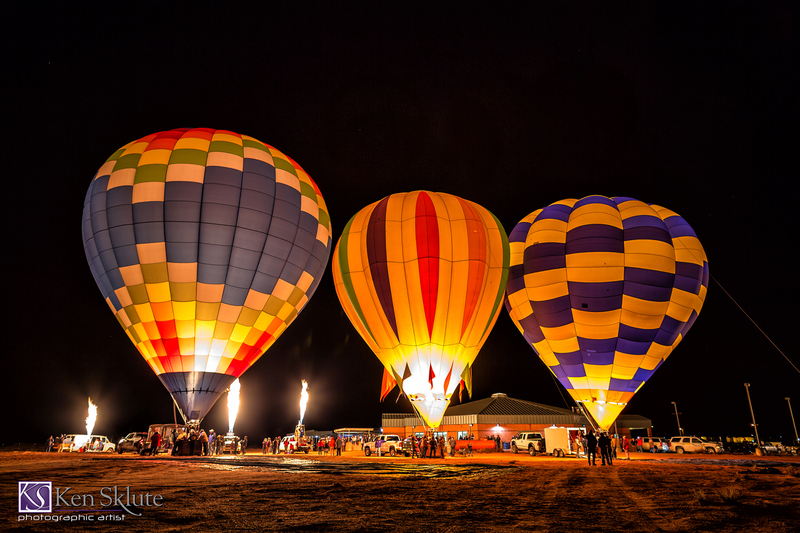 Now in the evening, you will have plenty of light and less people crowding around the balloons. Mid-range zooms like a 24-70mm or 24-105mm (equivalents for APS-C sensor cameras would be lenses like a 15-85mm or 18-135mm) allow me the versatility of a wide-angle lens and a short telephoto for compression of the balloons. Lens compression is an effect created by using a longer focal length lens to capture a scene where you will visually bring the background closer to your subject. You can create the impression that there is more distance from your subject to the background by using a wide-angle lens. Enable the "mirror up" function on your camera. This will allow the mirror to rise on the first depression of your cable release. The second time that you depress the cable will now allow the shutter to fire with minimum vibration when you're tripod-mounted. Canon generally recommends that stabilization on Image Stabilization (IS) lenses be turned off when you know you'll be on a solid tripod. This will prevent the IS from actually vibrating your camera when it is mounted on your tripod. Lastly, make use of Live View when focusing at the balloon glow. It will be dark and challenging to see through your viewfinder to find focus visually and the use of auto focus may also be a challenge. Using Live View provides you with the ability to "zoom" in on your subject either 5x or 10x to focus precisely where you would like to. Determining the correct exposure setting for the glow may be a little confusing because the background for the illuminated balloons is the dark sky. 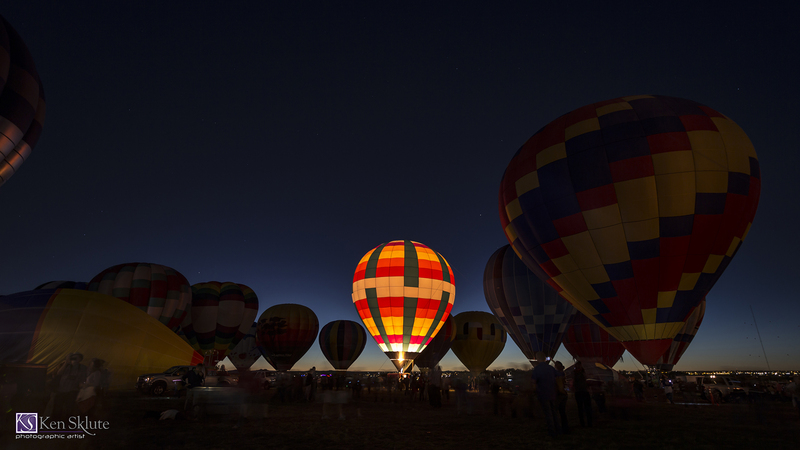 Using one of the automatic modes will average the dark of the sky and often overexpose the lit balloons. Therefore, I tend to select manual mode so that I can accurately set the exposure for when the balloons actually glow from the internal burner. I generally use an ISO of 320-640, which provides a shutter speed of approximately one second, when the pilots light the burners. I like to select f/7.1 as my aperture to allow for some depth of field as the balloons will be a few rows deep. Wind is sometimes a factor during the evening’s festivities. If you see that it is a bit windy and causing the balloons to gently move, you may want to consider a higher ISO setting combined with a slightly shorter shutter speed. If I can see the balloons moving, I will go up to ISO 1600 or higher and shorten my exposure to 1/4 or even 1/15 sec to minimize that movement caused by the evening breeze. Setting your White Balance (WB) can be tricky during the evening. I tend to use the preset white balances rather than Auto White Balance (AWB). I will begin the session with the preset "Sunny" mode in order to keep the color in the sunset sky as realistic as possible. Once I see the color in the sky fade into black, I will switch my WB to "Tungsten" mode. This will now remove the cast of the very warm colored flames of the balloon burners. I think that you will enjoy the change, maintaining the color in the balloons. Composing your images can be fun! Variety is key — I enjoy moving through the crowd and the balloons to see about creating different shape compositions. If you find one balloon to be closer to you than other balloons, you may want to center that balloon in your composition, creating an apex or tall center, and the other balloons in your image will take a secondary position, drawing your viewer’s eye to the kind of triangular shaped composition that you created. 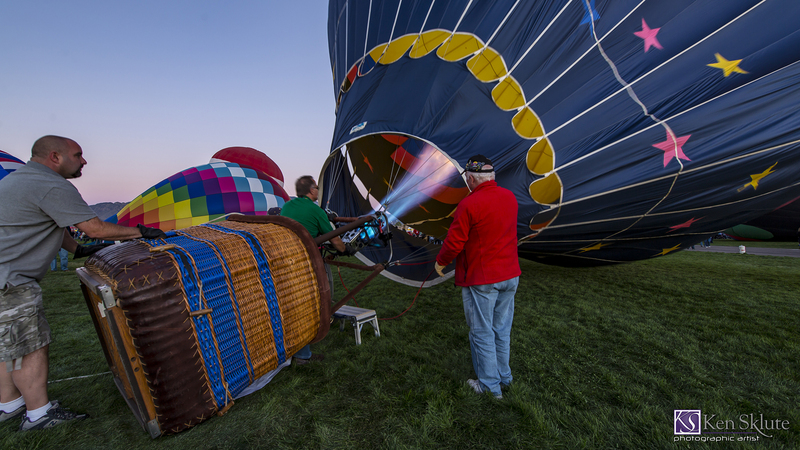 I also enjoy getting close to one balloon, showing the pilot, the burner and just the mouth of the balloon off to one side and the remaining balloons behind it. This creates a near/far effect that so many of us enjoy using while creating landscape images. I hope that you can apply this to your photography. As photographers, we are always making decisions about a shutter speed short enough to create a sharp image of a moving subject, in this case, in challenging light. I want to remind you to select an ISO that will provide you with a shutter speed/aperture combination that will give you enough depth of field and action stopping shutter speeds, all to help you create the best photographs that you can possibly make. In the next article, I will share my techniques for photographing the fireworks that follow each of the balloon glows during Albuquerque International Balloon Fiesta.